I really enjoyed My Secret Rockstar Boyfriend by Eleanor Wood. It was fun and funny and the main character had an amazing voice. Loved her relationships with her mum and best friend. I thought her struggles with her feelings towards boys really interesting and of course, she's a blogger so I totally related. 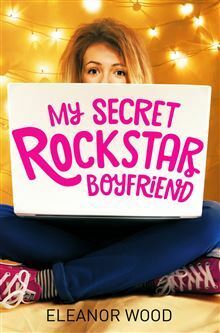 My Secret Rockstar Boyfriend appealed to my initially because of this fun, bright and colourful cover and I loved the idea of a slightly nerdy girl and a secret relationship with a world famous rock star. I love the idea of that fairy tale, I have to admit. So that was the draw for the book and what really kept me reading is the main character, Tuesday Cooper, and her really engaging and interesting voice. Tuesday (her real name) is a music blogger and inserted throughout the narrative are some of her blog posts about music and I loved reading them. It doesn't matter to Chew (Tuesday's nickname) that her only readers are her mum, her two friends and her boyfriend. She loves music and wants to be a writer so her music blog is a way for her to channel some of that. Through this blog posts, she comes across Jackson Griffith, famous rock star who seems to love her blog and her thoughts on music and they begin this strange sort of email correspondence. Also in Chew's life are her two best friends, Nishi and Anna, who are a couple. I absolutely loved them. At the beginning of the book the three of them are out searching charity shops for interesting clothing and Nishi makes a joke about Nishi and Anna's relationship and Tuesday asks very seriously if she's allowed to laugh at that. And I think my only criticism of this book is that I would have liked to have seen the exploration of friendship between a straight girl and her two lesbian friends a little bit more. I also loved the music references. I was born in the 80s and was a teenager in the 90s. I love Nirvana and so much of the music that Tuesday writes about on her blog. And I've always daydreamed about what it might be like to have a famous singer interested in you. And then there's the romantic elements of the book. Chew has a boyfriend, Seymour, who is also a singer in a rock band. And at the start of the book, Tuesday is really grateful and counts herself lucky to be Seymour's girlfriend and I loved the sort of realisations that she comes to about Seymour and how she feels about him. It took her an exceedingly long time but it is her first relationship and she struggles a bit with confidence so everything, while at times frustrating, makes sense. Other bits I loved: Tuesday's relationship with her mum and seeing a more realistic look at A-Levels. All in all, this book was a real joy to read. I loved the friendships and relationships. The combination of blogging and music and some of the more outlandish visuals this book inspired. Mostly Chew's charity shop outfits and her eventful weekend!